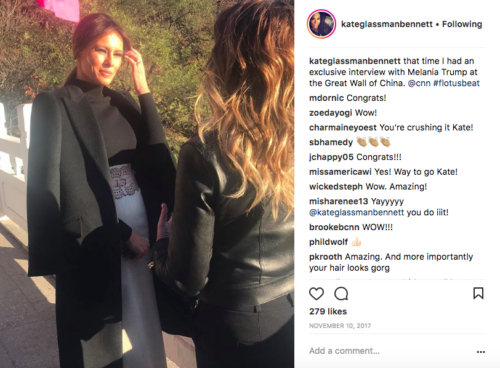 Kate Bennett is a baller – that’s just one of the many hats she wears (kind of like the ones Melania wears, which you only knew about because you heard it from Kate). She’s a CNN White House Reporter, Co-author of CNN’s Cover/Line newsletter, and the only one in the press corp to cover FLOTUS full-time. When Kate isn’t chasing down details on Melania’s wardrobe and giving you the inside scoop on what’s going on inside the East Wing, she’s cheering for daughter Tess on the soccer field, and for herself at Solidcore. As co-author of CNN’s COVER/LINE, what’s been your favorite topic to write about? The great thing about Cover/Line is that I can write about anything really. I like sort of being able to think out loud about the news or a headline or a particular point of interest that has people’s attention. I figure if I’m thinking about it, maybe you are, too. And the dishy stuff is just interesting, and it’s what I would talk to my friends about at the end of the day – also I always love to do “Dress Like the First Lady.” I dig Cover/Line because it’s news, but it’s fun (and sometimes funny), and it isn’t a gazillion sections long. It’s the perfect break in the day. You follow all things FLOTUS – What would you say is the most surprising thing you’ve learned about Melania Trump? I think the most surprising thing I’ve learned covering Melania Trump is how human she is. There’s a perception that she’s this cold, unsmiling, sunglasses-wearing, fem-bot or something. She is not. She’s warm, she’s thoughtful, she’s a stickler for detail and history, she’s smarter than people give her credit for … and she’s not being held against her will in the White House. She’s learning a job and a role that through history is, by definition, one that each individual first lady creates for herself. There is no template, and that’s even more the case for Melania, who comes to it with far less experience than any of her modern-day predecessors. She’s not making the inroads in policy or the impact via public speaking that I think she could be capable of, and for that she deserves some criticism, but I think we’ll continue to see her make progress, albeit slowly. People like Melania Trump – she’s up 10% in favorable rating in a CNN poll we took this month. That’s a massive jump – she remains the most-liked member of this administration. And I find it so totally compelling how the East Wing operates on an entirely different plane from the West Wing. There is none of the back-biting or the chaos or the turnover, or the leaks, which makes my job a little more difficult. Speaking of iconic women, thoughts on Meghan Markle and the Royal Wedding? 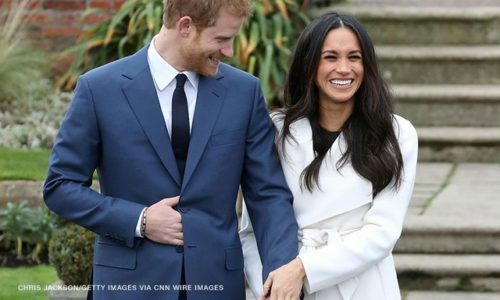 I leave for Windsor this week to cover the wedding for CNN, tune in starting 4AM EST! I’ll be on for like 7 hours straight, so, yes, I have all the thoughts! 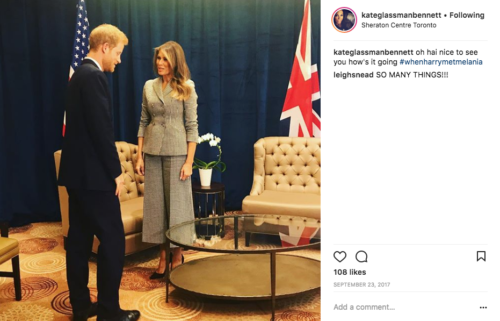 I’m going to be way more “Cove/Line Kate” than “East Wing Kate,” which means I’m going to chat about the fashion, and the fun facts and the off the radar details that we all want to know – I’ve got you, boo. Right now I’m studying this 300-page binder the producers put together for me so I’m a total expert on random info and obscure European royalty (which I kind of always was?). Overall, Meghan has to walk a tight line between being this incredibly modern American woman and paying homage to the British monarchy and tradition – it’s really a balancing act when you think about it. Any similarities between Melania & Meghan (besides the letter M…)? Melania and Meghan both love a coat! Seriously, between the two of them, they have pretty much brought back the coat as a style piece. I also think they have the whole “stranger in a strange land” thing in common. If you had asked either of them even two or three years ago if they would have ever imagined themselves in the lives they live now, I am pretty sure they would both say no freakin way. Let’s face it – we live on our phones. What’s your advice for finding real relationships in a digital world? Oh boy. I’m not sure if anyone would want relationship advice from me, but I would say no matter how you go about it, digitally or otherwise, don’t give up. And don’t be a tool. BONUS! Favorite spot in DC? This is hard because I’m fourth-generation Washingtonian – my favorite places are mostly tied to family rituals and memories. And food. Let’s go that route: Bethesda Crab House, to split a dozen with my grandmother; The Prime Rib, where we’ve celebrated special occasions for literally decades, and where I always try to finish the prime rib, but never do; Café St. Ex, for drinks and garlic fries with my best friend, Glennon, served up by our buddy Caleb Marindin, who mans the bar; the Pines of Rome, where me and my kid split a pepperoni pizza like I used to do with my mom back when I was her age; Breadline on Pennsylvania Avenue near the White House, for a prosciutto piadine and people-watching.